This is a sponsored post. All opinions are 100% mine (plus I LOVE Fabric.com). Please see my disclosures page for more information. Making our master bedroom a serene retreat is on the top of the list this year. One of my favorite things to do, indulgences even, is to buy fabric and dream about ways to use it. I love decorating by sewing curtains to creating throw pillows to making chair slipcovers and more. Fabric.com is my top choice for shopping for the perfect color, design, and style for any project. I’ve ordered from Fabric.com in the past and love how easy it is order and have the product shipped right to my house! Also the amount of choices on the site is unbeatable! For the master bedroom makeover, I’m planning on using yellow, grey, and off white or beige. I’d also like to find a way to incorporate hints of blue in the fabric as several pieces of artwork we have in our bedroom have blue as a main color. The main fabric items are the comforter, throw blanket, accent pillows, and curtains. The Comforter – I’d like a pattern because the entire family watches movies in bed and sometimes spill snacks. That means I need a fabric that can hide stains or stand up to lots of use. The Richloom Moravian Dove fabric(4.) would be my choice because of the pattern, and it is an indoor/outdoor fabric which is what our busy family needs! The Curtains, Pillow Shams, and Bed skirt – Oh, who doesn’t love silk?! Curtains and bed skirts are places that silk could be used in this active house. Curtains and the bed skirt are the least likely to be stained in someway from kiddos and dogs. Since this will be for the master bedroom retreat, a little bit of luxury is in order. And what is more luxurious than Dupioni silk(3.)? I’d also like to use this for the pillow shams to tie all of the different patterns and textures together. To frame the shams, I would create piping with P/Kaufmann Secret Garden Linen Mist(1.). The Throw Blanket – Like I mentioned earlier, we love to all pile in our bed to watch Disney movies or even the occasional MacGyver episode. That means we need extra blankies and the Minky Cuddle Dimple Dot Charcoal(5.) fabric would be perfect! The Decorative Pillows – I like introducing different patterns and textures with decorative pillows. To tie the master bedroom fabrics together I would use fabrics 1., 2., and 5. These could also be even more cohesive by mixing and matching using the fabrics as each others’ piping(including the silk vehicle as well). Using the Project Design Wall really helped me coordinate all the fabrics I want to use for this master bedroom project. Initially, there were a bunch more choices on the project design wall and having the wall helped me weed out fabrics that didn’t really match whether in color or style or scale. 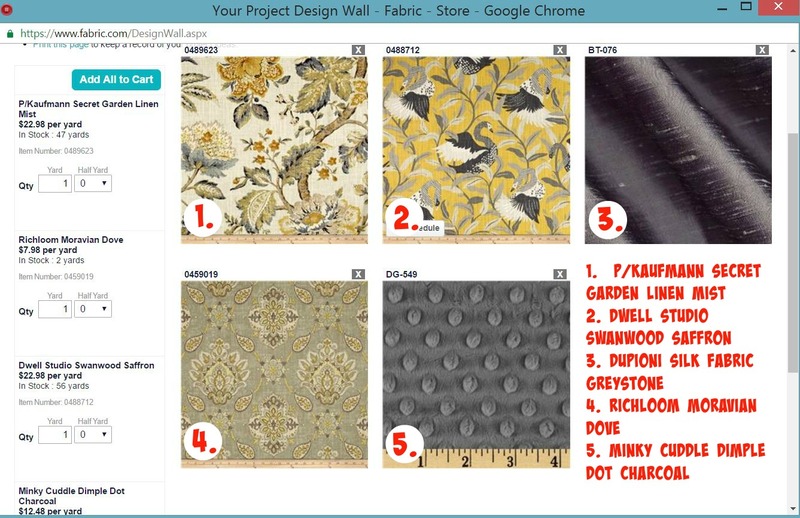 I also love how easy it is to add different fabrics to the wall by selecting “Add to Design Wall” below the picture swatch during searching. A pin for your friends!